Effective and impactful presentations are integral to your job success. We use presentations to sell an idea or a product, both internally and externally. How do yours stack up? We all know the kinds of presentations we like to see: those with less text, fewer bullet points, and more visuals. And yet time pressures and habit too often lead us to break the “golden rule of presentation” when we have to create our own slides. 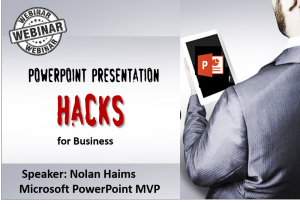 Join presentation expert and Microsoft PowerPoint MVP Nolan Haims for a 1-hour special PresentationXpert webinar on creating better presentations through more efficient use of PowerPoint and by implementing time-tested techniques for eliminating the major causes of tiresome slide decks in the corporate world. Managers, supervisors, graphic and PowerPoint professionals, administrative assistants, sales professionals, marketers – anyone who uses Microsoft PowerPoint and wants to save hours and save hours of productivity. You’ll get a list of sources for imagery – both paid and royalty-free, access to Nolan’s magic list of corporate brand logos, a cheat sheet for hacks and shortcuts, and more. With more than 20 years experience in the field of visual communications, Nolan Haims helps organizations and individuals show up differently and tell better stories with fewer words. As principal of Nolan Haims Creative, Nolan leads a team of visual design professionals dedicated to all types of visual communications including presentation, data visualization, traditional print and identity design. As a designer and art director, he has created high-end presentations, keynote addresses, and pitches for Fortune 500 CEOs, leading financial institutions, top foundations, and all the major television networks. 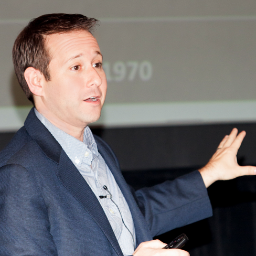 Most recently as a Vice President and Director of Presentation for Edelman, Nolan helped the world’s largest public relations company consistently win multi-million dollar pitches by communicating more visually. Nolan trains organizations to think visually and to create and give more effective presentations. He speaks at national conferences and writes extensively on visual storytelling, including at his own site, PresentYourStory.com. For his continuing contributions to the presentation industry, Microsoft has designated Nolan one of only eleven PowerPoint MVPs in the U.S. As such, Nolan consults regularly with the development team on the industry standard software. In a past life, he was an award-winning magician and juggler and performed with the Moscow Circus and Vermont’s Circus Smirkus before turning to theatre. Nolan directed and wrote professionally, creating stories on stages in New York and around the country for a decade. He holds a degree in media writing and theatre from Northwestern University.